When you find yourself committed to hosting drinks mid-week for friends, which always feels like a cool and spontaneous thing to do at the time when you put the invite out on a whatsapp group- all feels so exciting, like the old times, everyone saying things like ‘yayyy just what is needed’- you of course visualise it in your head- you looking so easy breezy floating around your kitchen opening cold bottles of wine, the perfect playlist, a maybe balmy summer breeze and delicious things beautifully presented plated up for all to nibble on- but in reality the day arrives with dreaded doom! Why oh why during this busy working week have I put myself through this? Why didn’t we just stick to the original plan and plan this out somewhere? You end up getting yourself into a flaff of organising everything last minute, running about your neighbourhood picking things up- maybe spending double the amount you would have as you think throwing money at the situation will help it. Then there is always the friend who turns up early, which is not helpful at all(! ), as they think how fun to come straight from work and have an early catch up and glass of wine- at this point you are wishing they could disappear as they are offloading their work problems onto you- whilst you are charging about, and still needing to set up and get ready. The amount of times we have been in this situation, even with some of our big catering jobs- we are confident that we are well prepared- but there are always last-minute things that take up time. Getting all shopping, prepping, and as much cooking and organising done the day before is a must if you are out at work that day. We find the most helpful thing, which sounds like a no-brainer, is to sit down and write a list of things to buy and what needs prepping- and to think of a bit of a theme when you are thinking about what to prepare for food- maybe Italian vibes with bruchettas, olives and good quality sliced meats and cheeses or middle eastern vibes with dips, flatbreads, grilled meats. A HUGE favourite of ours is something hot and crispy that you can dip into a zingy fresh sauce, the perfect play of contrasts. That’s where this recipe was born from. These croquettes for us fit that bill, so easy to prepare the day before- get to the part of rolling the balls, then placing them in the fridge for you to roll in egg and panko before friends arrive to shallow fry, also make the sauce the day before. They are delicious- make sure to get the curry leaves, they really make a difference. We buy from Parkway Greens in Camden Town, but you will be able to purchase from most green grocers and Asian supermarkets. We played around a bit with this recipe, trying potato over a bachmelle- but the bachmelle really lends itself well to the texture and flavours. This summer get these hot and crispy dunked into the spicy green sauce and cooled off with a crisp cold glass of white… heaven! 1. In a shallow pan add the fish, milk and bay. Simmer for 5 minutes and then take off the heat to cool. 2. In a small pan add the butter and melt, sprinkle in the flour. Stir constantly until the mixture forms a smooth paste. Cook over a low heat for a few minutes. Add the warm poaching milk to the roux- when all the liquid has been absorbed add the remaining ingredients, barre the fish, and stir around to infuse. Take off the heat and flake in the fish, season generously. Let it rest in the fridge for 30 minutes to cool. 3. To make the dipping sauce add everything to a blender, with a good squirt of runny honey and a little seasoning. Taste for adjustments- more lime maybe or more spice. 4. Put your whisked egg in one bowl, the flour in another and the panko on a large plate. Take your fish mixture from the fridge and take a tsbp amount and roll into your desired shape (hands will do)- we like keeping it round. Roll into the flour, then the egg then the panko. 5. It is now ready to shallow fry in batches. Use groundnut oil, and get the pan very hot. Put in enough oil to half over a croquette, shallow fry for a few minutes on all sides and leave to rest in kitchen paper. Once done fry the curry leaves for no more then a under a minute- to crisp up. 6. 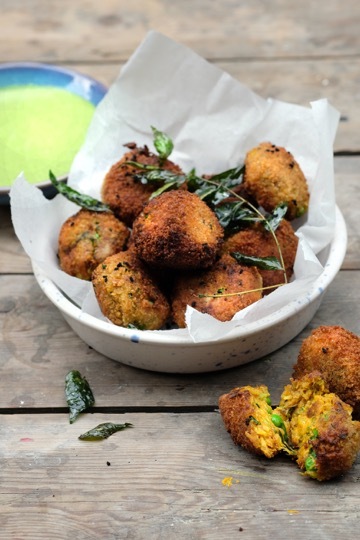 Serve with the crisped leaves and nigella seeds, a good squeeze of lime and the dipping sauce.